Cheap pond liner is perfect for building a pond. It allows the pond owner to create ponds of various shapes and depths. Sometime, when it comes to small backyard ponds I often prefer to use the pre-molded ponds instead of using an EPDM Firestone 45 Mil Liner...I dunno...it just works great to use a ready-made pond in the small scale. I've installed many of those hard shell ponds and they are fairly easy to install except for maybe some issue with leveling things out after you've dug the pond hole. For large ponds over 8 x 10 there really isn't an option for a molded pond so a liner is the only way to go. Many complete pond kits on the market include a large piece of pond liner along with the skimmer and filter falls. When it comes to larger ponds I almost exclusively use the 45 mil fish-safe pond liner. After 2010 Firestone, one of the more familiar manufacturers, switched to a 40 mil thickness liner which is now the standard for landscapers and pond builders although 45 mil is still available. Unless you are using a molded plastic formed pond or are digging or excavating a large natural earth pond in blue clay then you will likely need to use a pond liner. A pond liner is basically a resistant and watertight membrane that keeps the water in your pond. Pond liners can be the most expensive piece of the initial pond build so make sure you measure twice and order once because the planning of your pond is the key to success! After you have done the initial layout of your pond and maybe even after you have sharpened your shovels and started digging the shape of your pond out of the front lawn you should stop and do some simple calculations to figure the size of the liner you will need. Establish the size of the liner before going to far in to your planning as the importance of correct sizing when using a membrane cannot be overstated. When a liner is costing over $1.50 per square foot you want to be very careful before you order the sheet of EPDM that is 380 square feet only to discover you needed a piece that is 780 square feet! I've been there and it's a long way back!! So we'll assume that you will be requiring a pond liner which is also called a membrane. Smaller basins and backyard ponds only require a lightweight material. We use a PVC, polyvinyl chlorine, membrane that will resist frost and ultraviolet light. Sunlight will damage cheap materials so it is best to ensure your membrane has this protective feature, most do but you should ask your supplier. Most 20 mil membrane should cost around $1 per square foot and can be bought in standard sized rolls or get a custom size piece cut at your local garden supply store as most such retailers carry this and the 35 mil liner that is slightly thicker and can buy for $1.50 per foot. The 20 mil and 35 mil materials should come with a 20 year warranty if you place a geo-textile protective barrier under and on top of the liner. There is a 45 mil EPDM, ethylene-propylene-diene-terpolymer, heavy -duty membrane that is available and we often use this strong and puncture resistant material for waterfalls and streams between two basins. It can cost from $0.80 - $1.50 per square foot. Using a thicker material will reduce the risk of a breech or puncture which could result in you're fixing a leaky pond. Luckily, these membranes can be repaired and sealing foam is available to help with sealing a pond. Many beginners take measurements from their outline and do some rough calculations and then scurry off to the pond supply store with such enthusiasm only to come home with a specially-cut length of material to find that it is too small. Here is a simple formula to help calculate the dimensions of the pond liner you'll need. Width - The formula to determine the width of your membrane is 2 x pond depth + pond width + 2 feet = required width. Length - The formula to determine the length of your membrane is 2 x pond depth + pond length + 2 feet = required length. .
20 (width) + 6 (depth) + 6 (depth) + 2 (overlap) = 34 feet in length minimum membrane liner width size required according to the pond liner calculator. 10 (length) + 6 (depth) + 6 (depth) + 2 (overlap) = 24 feet in width minimum membrane liner width size required according to the pond liner calculator. In this example you would need a liner at least 34' x 24'...unless you have a custom cutting facility nearby you may need to buy a standard sized roll. Many manufacturers offer standard rolls of 45 MIL, 30 MIL and 20 MIL liner at low-cost. Remember it can be much cheaper to modify your pond plans to accommodate a standard liner roll size. In the above example a 30 foot by 30 foot liner can be bought for 15% less than a 34 foot by 24 foot custom piece! Be flexible...that's what pond life is all about! Don't forget to add whatever you will need to cover the waterfall spillway if your design calls for that. You can use scrap or leftover pieces for this, but just be sure you have enough left to do the job you've intended. As my Bass fishing buddy Jared said to me one day as we drifted into the shoreline reeds, pond liner is a bit like Budweiser...it's better to have a bit left at the end of the game instead of running out before the end of the fourth quarter! Cheap pond liner is perfect for building a pond. It allows the pond owner to create ponds of various shapes and depths. Sometime, when it comes to small backyard ponds I often prefer to use the pre-molded ponds instead of using an EPDM Firestone 45 Mil Liner...I dunno...it just works great to use a ready-made pond in the small scale. I've installed many of those hard shell ponds and they are fairly easy to install except for maybe some issue with leveling things out after you've dug the pond hole. For large ponds over 8 x 10 there really isn't an option for a molded pond so a liner is the only way to go. Many complete pond kits on the market include a large piece of pond liner along with the skimmer and filter falls. When looking at pond liner there are various thickness and strengths which resist tearing and puncturing to a lesser or greater degree. A pond liner, if installed in sharp rocky terrain may need a geo-textile covering and a sand underlay in order to prevent any sharp edges from causing a hole that may leak in the future. The 45 MIL liner is the industry standard and there are a few brands and manufacturers and as long as the thickness is guaranteed to be the 45 MIL then the only difference you need to consider is price. EPDM Liners like the omnipresent PondGard by Firestone® is ideal for most backyard ponds and can be found in many local garden supply stores, the Firestone® PondGard 45-mil EPDM liner is the liner of choice for many do-it-yourself type of pond builder as well as professional contractors who need reliability and a long -life product and this rubber compound fits the bill. Extremely flexible, it is easy to work with and will stretch to conform to a pond's features. It is completely UV-resistant and will hold up well in direct sunlight. Carries a Firestone® 20-year warranty. 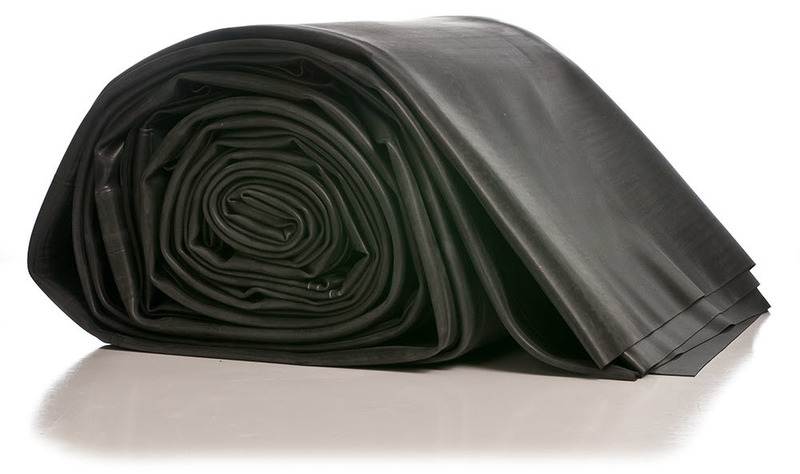 The EPDM liners can usually be bought for anywhere from $0.70 per square foot to $1.60 per square foot depending on the size and shape of the piece. Custom pieces cost more but standard sizes exist which can cost less per square foot. The ultimate in pond liners are the EPDM Linerthat is made of fish-grade synthetic rubber (ethylene propylene diene monomer). When used as a liner for tanks or ponds, the stretchability of this premium membrane will be appreciated. This heavier and more user-friendly than either PVC or polyethylene liners as well as the most resistant and durable pond membrane on the market. Unless it is a fairly small project or if the contractor or builder knows exactly what they are doing we rarely use the 30 MIL liner or membrane. Although it can be implicated in a successful build this PVC (Vinyl) Liner, 30 mil that is usually specially-formulated, food-grade PVC material that is 30 mil thick yet remains pliable in cold weather can sometimes be a disappointment if extreme conditions are expected. In most fabrications of this thin pond liner all seams are overlapped and heat welded for strength. Actual weight is approximately .2 lbs/ft2. All sizes are "nominal" and may vary by ±3". Vinyl is easy to repair with vinyl repair kits and most of the liner of this caliber is, of course, made in the USA. Another thing to ask yourself when building a pond or buying a liner is : Am I Cheap? Go on...ask yourself....are you cheap? Once upon a time I built a small pond on my property, nothing big, just a small pond about 800 square feet and I thought I knew better and checked out the different pond liner materials and I put this cheap plastic liner that was guaranteed for 10 years in my new pond, and guess what? Everything was fine for 7 years but then I started noticing some extreme pond liner degradation around the edges. As much as I ignored the problem I knew that all my landscaping and plantings and filters would have to be removed and I'd have to start again...all because I wanted to save $150 in pond liner! I now had to literally rebuild the whole pond because of a cheap streak running down my planning ledger!. Bad mistake. Now I make sure my pond liner is guaranteed for 20 years minimum so I don't have to consider a rebuild every 10 years . If you have a store nearby that specializes in ponds supplies, buy your liner from there and if they are knowledgeable and respond to your questions they will sell you a quality liner if you ask for it. Some of the big home garden supply outlets such as Home Depot or Lowes will often not have the highest quality liners available, as these all-in-one centers are geared towards smaller pond-system installations. If your pond project is a smaller one that's not too involved and budget is a factor, then a 20 or 30 mil liner from the Home Depot or True Value Hardware may be adequate for your needs. ML - Thickness of pond liners are shown in mils. 1 ml equals 1/1000 of an inch or 1/40 of a millimeter. A 30 ml EPDM rubber liner is a good all-around choice for smaller freeform ponds with a lot of twists and turns, especially if you are on a tight budget. It is flexible and easy to handle. For larger ponds with rubber liners, 40 ml and even 45 ml will work well and last for years. Synthetic plastic liners are usually sold in 20-40 mil thickness for home use. 40 is better but 20 or 30 may be just fine in some instances. EPDM - Ethylene-Propylene-Diene Monomer: This is an industrial grade rubber available in varying thickens, and is the best bet for most all pond installations, but is also the most expensive option. It is flexible and easy to work with, and conforms nicely even when twists and turns are involved in the pond installation. HDPE - High density polyethylene - This is a heavy duty synthetic plastic liner sold in 20-40 ml and up thickens for home pond use. It is a bit less expensive than rubber liner, molds nicely to tight corners, and usually comes with a 20 year guarantee. In some situations, especially large ponds that need to be done economically, this is a good choice. PVC - Poly Vinyl Chloride: Synthetic plastic liner. This is a budget liner and is the one that you will probably find at the local home center. It usually comes in 20-40 ml thickens and will mold nicely around twists and curves. PVC liners come with a 10-20 year warranty for perfect conditions, but are definitely not as durable as rubber or even HDPE. Fish Safe - Always be sure that the pond liner you buy has a "fish safe" guarantee. The manufacturing process for fish safe pond liners is different than for other uses, and some liners that at first glance look like they could work well in a pond will emit gasses and chemicals that are fatal to fish. For instance, if you know someone who does roofing work, they might come across some roofing liner that looks like it would work for your pond. Do not use this, because it will almost surely kill anything you put in that pond. One thing to remember is that the heavy-duty membrane is heavy stuff! Large pieces need to be lifted by several people or by machines. Even a small 10 x 10 foot piece of 45 MIL membrane can really buckle the knees so be prepared to carry the weight...it's always best to have a few well-fed friends on-site to help haul the liner from the UPS delivery van down to the pond location!! When comparing liners it is a good idea to look for forums and reviews that discuss the pros and cons of various systems. Since the principals of aeration are scientific and many companies offer products that do basically the same thing to various degrees of efficiency then it is up to us as consumers to use our due-diligence before buying a pond aerator. To compare prices with our recommended systems we have grouped some of the more popular bottom-diffuser aerator brands together for comparison with our best aerator systems.